What do you do with old paint and varnish cans with product still in them? This question comes up every spring when homeowners get Spring Fever and start cleaning out basements and attics. We are no different at Atlas. My wife and I decided to take on this paint removal task as we hopefully prepared our basement to be turned into living space. First step, clean up the basement and get rid of clutter. The paint cans were all up high on a shelf, not infringing on floor space, which I cannot say the same for the air hockey table, ping pong table and fitness equipment, but the paint cans were clutter nonetheless. Out they must go. Most people don’t know that they can dispose of paint and paint cans in the dumpster they’ve rented or their weekly trash cart. This is a great option if you don’t have a lot of product left in the cans and if you don’t have a dozen or more cans. The primary stipulation is that the paint cannot be in a liquid state. Before disposal, you must dry up the paint. For small amounts of leftover liquid,a add sand, kitty litter or Quick Dry granules directly into the paint can itself. Once you’ve put a drying agent in the can leave it out in the sun with the lid off for faster action. For large volumes of liquid it is best to spread out the paint either by pouring it into a larger five gallon bucket filled with the sand, kitty litter or Quick Dry. Old newspapers help as well. You may also use an old steel tub if you have one. The main thing is to ensure the paint is no longer in its liquid state. If you can dry the paint within the paint can it came in you may toss the now dried up paint and the can into your dumpster or trash bin. Leave the paint can lid off. This is to prove to the trash collector that the paint inside the can is dried up; otherwise he may pull the cans out and leave them at the curb. My wife and I did not use Option 1. We had some paint dating back 17 years and at least 17 gallons! One of the cans was builder-issued touch up paint for the original paint applied to the walls. These walls have seen several coats of paint since then. The smart, fast and easy option for us was Atlanta Paint Disposal. We gathered up all the cans of paint, varnish, deck cleaner, and deck stain and dropped them off at a collection center. Many transfer stations and paint stores have drop off locations. Atlanta Paint Disposal lists all the drop off locations on their web site. It was fast, cheap and easy, we paid about $60 for all our paint and were done in less than an hour because the drop off was 5 miles away from our house. For < 12 cans & small amount of paint: Use the Drop Off Method. For > 12 cans & large amounts of paint: Use the DIY Method. 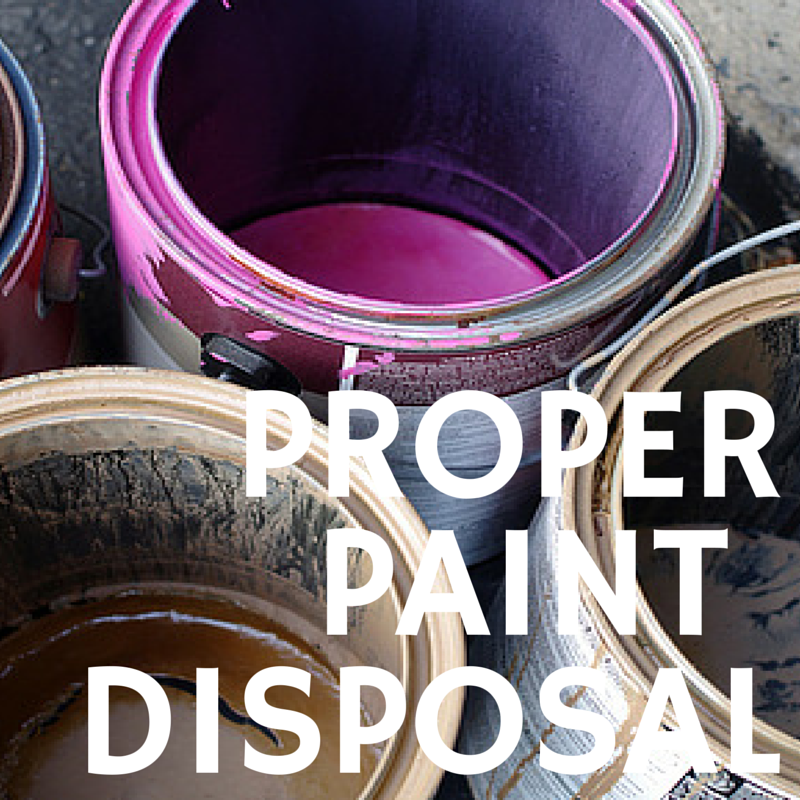 For the DIY Method, we recommend Atlanta Paint Disposal. With these simple tips, safe paint disposal need not be intimidating.